Simon & Schuster, New York, 2012. 148 pages. 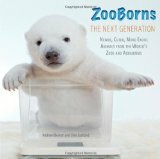 The book consists of pictures of baby animals from zoos and aquariums from all over the world. They’re babies. They’re cute. I only had to show a few, and I’d have a crowd of little girls after the talk, ooing and ahing over this book. But it is also packed with lots of facts. Besides exotic animal species – Have you heard of the Polynesian tree snail? The South American coati? The epaulette shark? The klipspringer? – there are plenty of pictures and facts about all the animals. The book tells the particular animal’s name, species, home, and birthdate, as well as their status (whether endangered or not) and several facts about the species. It’s fascinating stuff, mixed in with a whole lot of cuteness. I’m posting this review tonight in honor of Nonfiction Monday, hosted today at Wendie’s Wanderings. This entry was posted on Monday, September 9th, 2013 at 10:11 pm and is filed under Children's Nonfiction Review, Science. You can follow any responses to this entry through the RSS 2.0 feed. You can leave a response, or trackback from your own site.